Kia Soulster | What Car? 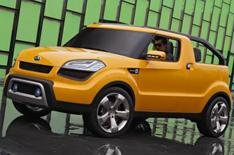 Kia brought a touch of sunshine to snow-bound Detroit when it took the wraps off its part pick-up, part-convertible Soulster concept car. The Soul supermini derivative is tipped to make production, and fits nicely with the fun, funky image Kia wants for its car. Hinting how close to production the concept car is, Kia says the two-door four-seater can be powered by any engine from the Soul range, according to the demands of markets around the world. It has a two piece top that allows the front and back seats to be exposed at the same time or independently. The four seats are in contrast to the Soul's five-seat arrangement, to give passengers more space and appeal to young adults who travel together. The rear seats also fold down to add space, while the front seats are fixed from the centre console rather than the floor of the car, to add leg space in the back or extra luggage space. Unlikely to make production are the quirky blue shades on the side vents, wing mirrors, headlamps and fog and tail lamps, although the LED lights may be retained to give the car more personality. Likewise, the chrome and carbonfibre detailing may not make production, depending on the on-sale price targeted for the car.